Wondering about blogging, this new interactive Internet option, bound to change the way humans communicate, learn and get involved? A blog is a software, which permits a blogger (I don't like the term either, how about writer) to communicate and the reader to respond. Comments, even if only to say hello are alway welcome. Most blog writers will gladly incorporate reader's input sent by mail. Blogs thrives on regular entries. These usually appear latest first. That is, to get the full picture the reader must read from the bottom up (in case of individual topics scroll down to their respective beginning). This blog, like most other blogs, is a live journal. Its has several sub-sites, devoted to individual subjects. In these sub-sites (you find them in the entries) posts are presented chronologically, with newest entries to be accessed from the side-bar. This blog represents one year of continuous blogging May 2006-7. It is followed by humuncu.li. 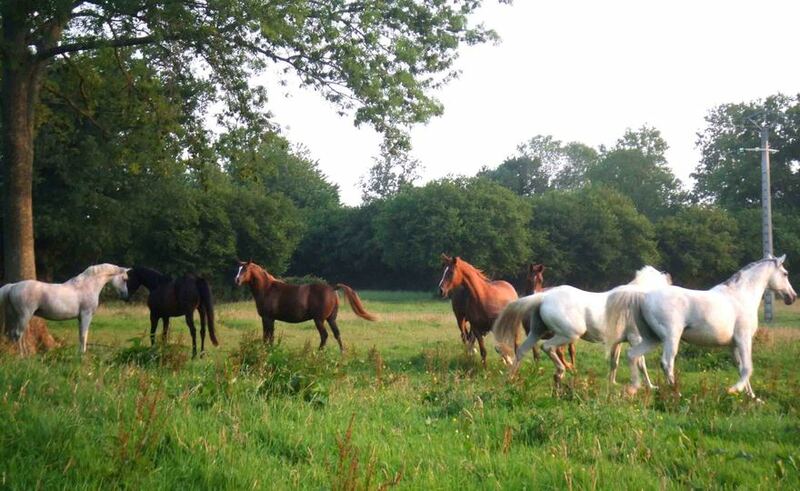 In Febuary 2009, we are adding a site for the School of Modern Equitation.. In December 2009 the Association of Interdisciplinary Studies' official blog site went online. Welcome to my new blog. Other ideas are on the way. For me, swinging music, horses in second gear and the art of antiquity create a sense of well being, of quality, of wanting to be here. Going downtown these days tends to create the exact opposite, a sense of defeat, of hopelessness, of shame even. Ashamed of being one of this race, with very different ideas though, of what is worth pursuing. Here is what this blog will be about. Human structure and its impact on the horse's positions (that is me the rider, reporting). Going about His business and my questions (that is me, God's daughter, sharing). All things human, that is, in addition to structure, the vertebra's role in man's uprightness, his learning and his perceptions. The question what motivates man. And OneHumanity's input and output, the way it views itself (that is me, taking the liberty to think). Just a sample, to show you what we are doing, looking at the horse's structure. The Nature of Ideas. Strange? Is it strange to combine in one forum such divers subject matters as music (and the music of the spheres at that), horses and how to ride them, true art, human physiology as such and as relating to the horse, the origins beyond our comprehension and their effect on that which is within our comprehension? Not to me, realising how the mind works: on many levels, in different tracks, at varying speeds. Heading in different directions, sometimes in diametrically opposed directions as well. How to contain, identify or tap those streams at useful intersections. How to filter out what matters: to me, to others, to the reader? That is the question at hand! Sports physiologists, Feldenkrais, Spiraldynamik, Zilgrei, Chiropractice, Ostheopathy and Yoga practitioners all deal with the one and only human vertebra. "Das früheste Erlebnis der Kunst muss ihr Erlebnis als Mittel der Beschwörung, der Magie, gewesen sein (art's earliest experience must have been an experience of invocation, of magic (see the caves of Lasceaux)). Die früheste Theorie der Kunst, die der griechischen Philosophen, fordert die Kunst als Mimesis, als Nachahmung der Wirklichkeit (art's first theory, that of Greece philosophers, demanded precise representation). Kunst...konnte nur die Nachahmung einer Nachahmung sein (art could be no more than the copy of a copy)." Color is a subject in physics, chemistry, physiology and psychology. The latter studying human responses to its shades and intensities. After researching Color (1) last night, I feel a bit stupid tonight. Because now I find out, that the color spectrum constists not of red-orange-yellow-green-blue-violet, as stated and as I was taught in school, but that it consists of red-yellow-green-cyan(a type of turquois)-blue-magenta(a type of purple). The first color system is called subtractive, the second additive. The subtractive color system concerns pigments, which absorb electromagnetic frequences, the additive color system are these frequences themselves. 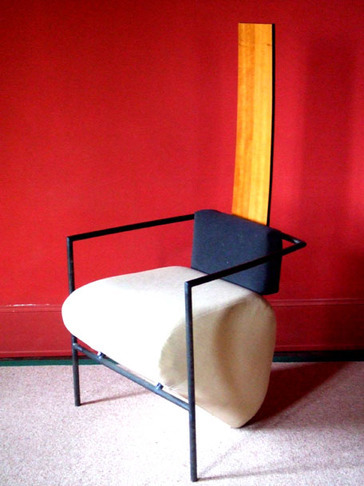 The color of natural objects and printing or painting is determined by the nature of pigments. The colors of the sky, of computer screens and light shows, the latter being made of phosphor particles, are determined by the addition of frequences. Light, then, is a range of electromagnetic frequences, which, in precise interaction with the human eye, produce the sensation color. Objects' and materials' pigments, on the other hand, by way of absorption, isolate electromagnetic frequences. Not these but their complimentaries produce the colors of the universe in the beholder's eye. The bundling of all color frequences is white light, their fraction produces the rainbow. The electromagnetic frequences of which light is composed, originate from ongoing planetary explosions. They penetrate the human eye at the speed of light. There is no obvious distinction between physiology, science (here physics and chemistry) and appearance. The partition of reality into disciplines may be useful for study. Understanding is the knowledge of individual phenomena and their interaction. Interaction appears to be the name of the game. 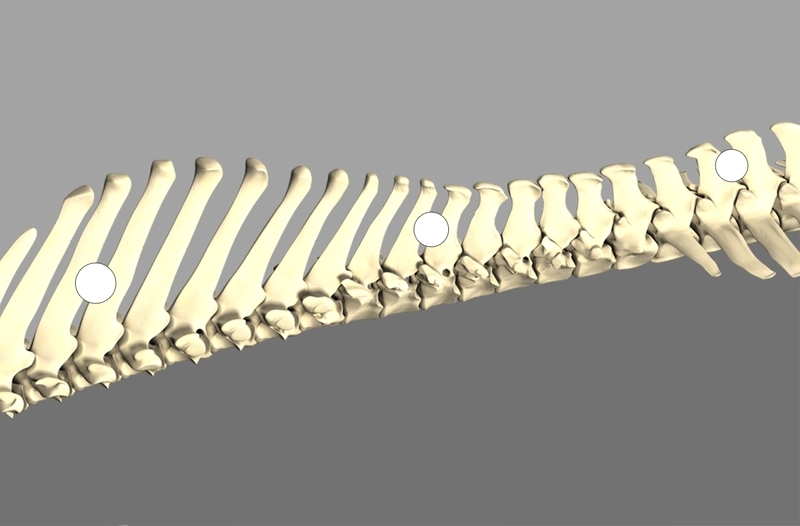 This second vertebra of the horse's upper neck holds a pivotal role in riding. It monitors the tension of the long ligament, which spans the horse's upper line, connecting poll and sacrum. This and other details I deal with in The Elements of Equitation (2005). Should there be any truth to mounting observations, which indicate man's ablility to direct the positions of his vertebra and the flow of his movements directly from the central nervous system’s sensorimotor part? Is it true that the human sensorimotor system corresponds to that of the horse. Not in subtractive but in additive fashion: the horse constituting one, man the other part. Is it true that human posture is perfected in riding? May one go as far, then, as to assume that equine physiology can inform on human physiology? The centauer, this ancient idea, represents these considerations. And yet, if you ask me, reality is more intriguing still. Are we not able to sing and be free...? The human hand, as concerns the skin, is innervated by C6 (thumb), C7 (index- and middlefinger) and C8 (ringfinger and pinky). Human movement creates an Ich-Bild (an image of self) on the inside of man’s skull. This image – though vastly distorted – resembles the human figure. Guess which part of the human body demands the largest area of this image, which in medical terms is called the Homunculus? Thomas Hanna, philosopher (who loved Camus) and physiologist (working with Feldenkrais, yet without abandoning his own ideas about the existence of a soma, a living being's kind of non-material blue-print), this Thomas Manna was able to heal many whom traditional medicine could not help. In the interview http://somatics.org/library/km-mom.html he speaks of some 400 alternative healing methods, which as the director of the Humanistic Psychology Institute in San Francisco he had the chance to review. Of these only three held up to his critical analysis: the findings of Moshe Feldenkrais, the methods grouped as bio-feedback and acupuncture. Where in the human does the I (the self, the me) reside? And does the Holy Spirit reside in this same place? For, "...be aware, I stand at the door and knock. The one who opens the door, him I will enter and I will sit down and dine with him." An astounding offer, made some 2000 years ago. I feel a sentence should follow here, concerning the power of His blood. For, the person who permits Him to enter his inner sanctum, this person He cleanses from all sins. This person is covered by His blood. I dare not elaborate on this statement, because I do not grasp its literal meaning... I take it as a fact. a more fitting lingual correspondence...). What motivates man, and to which end? the want to know learning. All three are subject to perversion. No matter how you turn it. Horses have not eaten of the tree, which has produced man's knowledge of good and evil. Question. 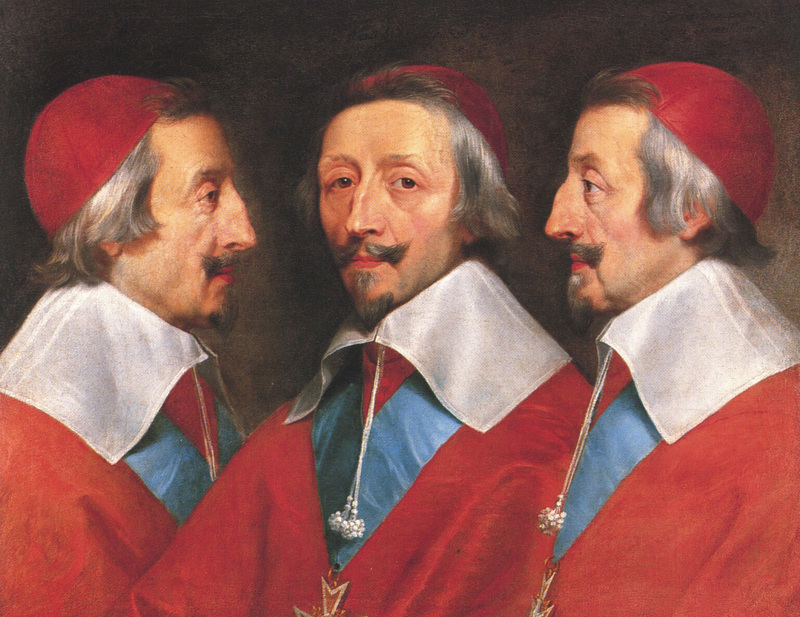 Would Richelieu, this man of instinct, if living today, still promote war as a means for peace? Now, that the world is fully populated. Now, that man has multiplied, has filled the earth and has subdued it? A first floor full of garments. Labels for all incomes, marked down 30-40-50%. Walking slowly I try to keep my cool. On the look-out for things to buy I view every rack. Sweating and disappointed I slowly begin to despair. There must be something here to purchase. At last a few pieces of promise come in sight. Still dealing with this nerve section C8 and its impact on human and equine posture. This nerve section, which in the human relates to making music and the supervision of the horse. This nerve section, which in the horse relates to straightness, agility and posture. There surely is an interaction between raising C2, activating C8 and doing things in style. Tear down to build up. Or, build with precaution and foresight, while keeping the good and discarding the useless. Produce at the rythm of maschines. Or, work with human hands, while using the means that assist. Serve global markets. Or, produce locally to supply local markets. In style. Some things are so fundamental. It is hard to grasp their meaning. 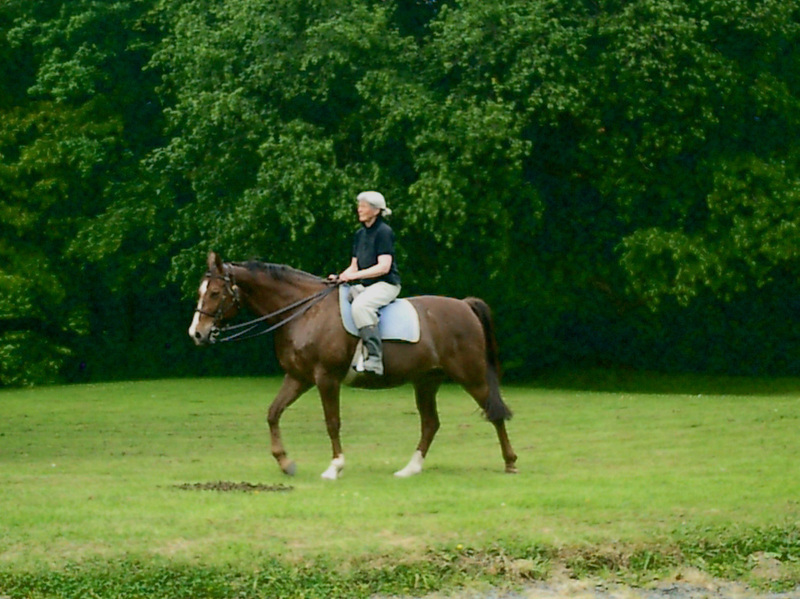 In riding this week it was the interaction of extending strides and the half-halt. My experiments with C8 may have to do with it. In the OneHumanity project it was the question of technology. Is technology a tool or is it, indeed, the master of humanity. Should one spreak of pre-technology and present man, the former being another than the latter. Technology is good, which relieves man from burdensome work. Because prolonged and incessant physical labor undermines human dignity. Technology is bad, which robs man of the opportunity to earn income, be occupied, learn, gain experience and excel. Technology's predominance today may be not so much the result of industrialism and its marketing methods. It may as well be the result of an erronious accounting system. To account for economic success in such terms as the GNP is to value unequal monetary profit at the expense of full employment, educational standards, socio-environmental concerns and individual well-being. There is a truly innocent pleasure, riding my horse out on the tracks, alone. With no one, really, no one any where near. And then, when I see the full moon rise from the horizon, I sense the fulness of life and remember to keep my peace. It was a publication by Glen Park on the Alexander Technique. I found it, while setting up my books yesterday. Taking Park's re-presentation of Alexander's work I detect a difference in his approach to mine. Alexander's point of departure was the human voice. Mine is the rider's effectivity in monitoring the horse. This difference may account for the variation in our results. 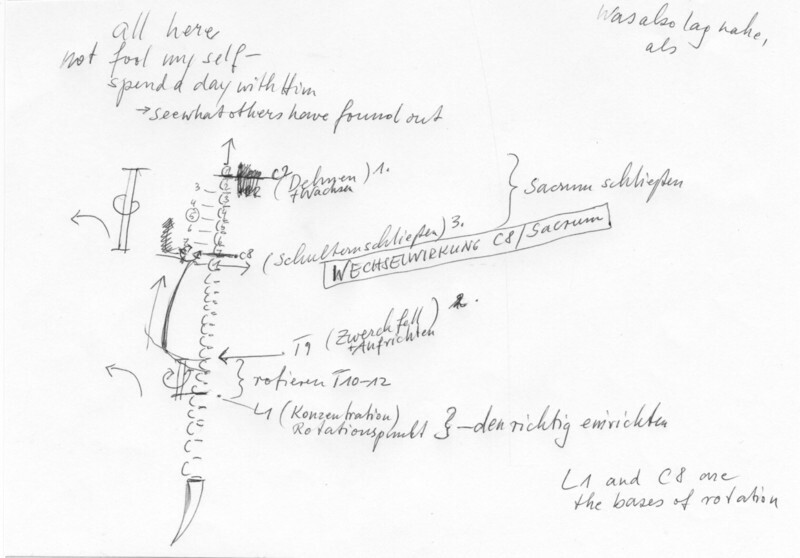 Alexander observed a stress-related foreward movement of the nerve section C8. The existence of this stress impulse is easily observed. It results in an undue curvature of the entire human vertebra including the neck. Alexander suggests an upward and forward movement of the head to correct this curvature. 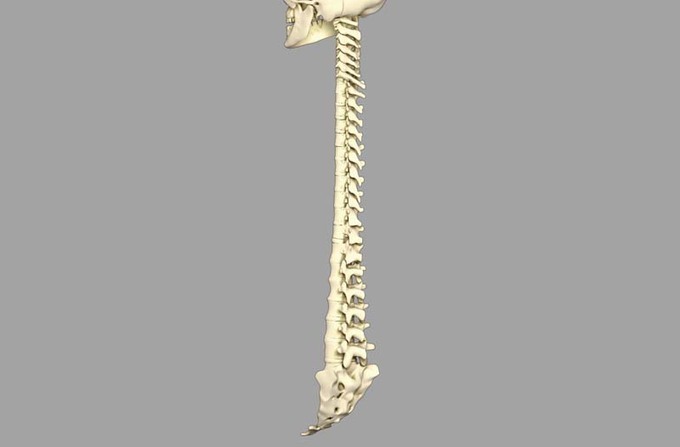 It stretches the human vertebra, in the process restoring it to its normal size. 1. Lift your head from C2, in the process stretching and straightening the vertebra. 2. Move back C8, in the process swinging the lumber area forward from L1, closing the shoulders and lifting the ribcage. The latter releases diapraghm and sides. 3. Gently lean your elbows against your hips, in the process creating a nerve impulse flow from the horse's mouth to L1, which is where - in the human vertebra - the spinal cord ends and the sensory-motor system transits into what is called the horse's tail. Ethos, the horses' habitat in ancient Greek language, is the root word for our ethics. Thank you, Emile, for the information. Thank you, Gerd, for the image. Thank you for the horses’ habitat. Study-Horsemanship, this inquiry into the nature, history and physiology of the horse, the rider and riding began 2001 with a …Bestandsaufnahme… of equitation today. If you would like to follow-up on research results please go to http://otherideas.typepad.com/report_2006 and there look at the second part of the introduction. In its fifth season, this year's research addresses the rider and his role in equitation. In light of equestrian research and schooling options in La Boulaye and the new OneHumanity research (please see the previous entry), the Association of Interdisciplinary Studies (see http://aishome.blogspot.com) offers annual internship programs in riding, research and visualisations. Those interested please contact me for further information at c.sander@st-ho.com. How often do you find a tall, stately, all black English throrough-bred mare, honest and courageous enough to survive two break-downs, to live and walk. Her name, Secret Taboo, says it all. Last night we went on a late evening ride. After the ride, walking her back to the field in the falling light, I noticed her composure. She no longer - in proud desperation - gazed at a distant land far beyond the horizon. No, her head lowered, she was right there with me. There is no need to argue everyday reality. There may be a need though for information on how to enter this reality. I will do so by telling my own story. Today, some thirty years later I with confidence confirm the psalmist’s saying, ‘…I will live in the house of the Lord forever’. Those who know me personally will confirm that I am no different than any other human… , but for the fact that He stands up for me. Walking one of Normandy's landing beaches, I saw a human foot print and not far from it a grafitti spelling 'I love you' surrounded by a heart-shaped line drawn in the sand. So much for basic human expressions on this surface of Planet Earth today. "Even if the United States and European Union were somehow to succeed in achieving all their other goals elsewhere in the world, no American or European will be safe so long as the conflicts of the Middle East remain unresolved." Excerpt from Crescent of Crisis, US-EU Strategy for the greater Middle East. Purchase from Brookings Institute Bookstore. This book by Ivo Daalder, Nicole Gnesotto, and Philip Gordon on experts' evaluation and advice invited by the Brookings Institute, Washington D.C., the EU Institute of Security Studies in Brussels, the King's College London, the Stiftung Wissenschaft und Politik, Berlin and the Foundation pour la Recherche Stratégique, Paris seems a good source of information and a departure point for dialogue. My question: How likely is it, that the US and EU will succeed in bringing peace to the Middle East. Must not, therefore, the idea of safety as an obtainable good be abandoned. And does not in fact safety depend on another, an other-worldly parameter? As we go along ideas pop up. I went ahead and started a list of current projects, which you can download below. This list is done in a Word file and will be updated, updates always to be found in the latest entry. Please feel free to comment in the download, save and send your comments to c.sander@st-ho.com to be incorporated in http://otherideas.typepad.com/dialogues. On my way to the beach today I passed a statue. One finds this sort of sculpture all over Normandy and for that matter all over Europe. This particular statue struck me because of its size, complexity and look. a female figure (which I immediately associated with Mary, the women who went for listening and learning rather than doing the dishes and waiting on guests). To the right a man, which I think of as John, His friend. In the middle, a human figure fastened to a tall, wooden cross by way of nails, which were driven through the palms of his hands and his feet. This figure I prefered not to look at, because I would begin to feel his pain if I did. Preparing for a dialogue on Heidegger. Researching dates of Old Testament texts, I began to wonder what else might have happened at the time of their origin. How many people lived on Planet Earth, how many people may have lived by then in total? The books of Moses and Joshua, Moses' follower, date to the 15th century B.C..The books which speak of King David to the 10th century B.C. Psalms, Proverbs and Song of Songs date to this time as well. Preliminary Considerations, Part Two. History of the Concept of Truth: Not Historical Confirmation, But Return to the Originary Greek Experience of ‘Unhiddenness'. Rereading the last paragraph of Heidegger’s, ‘The Essence of Truth’, Preliminary Considerations, Part One, which I responded to previously, I can’t help but note the limitation of translation. What here is translated as ‘…spiritual luxury’ most likely speaks to the intellectual…. Looking up Manethespaceman's comment in Not At All Obvious (5) and his hint at Jaques Lacan, I consulted Wikipedia. Can anybody tell me if this presentation represents this thinker's, philosopher's, psychoanalysist's work well? Which of his books would you read if you had time for only one...? Looking up Jaques Lacan in Wikipedia I ran across a chapter The Other, which I also linked, first to the entry Not At All Obvious (1) and second here. The Other proposes the definition of God as The Infinite Other, which of course points to the misunderstanding that persists with the almost exclusive use of Aristotle’s formula of truth dating to some 400 years B.C. See previous entry… (Here I must admit that after, foolishly, not having noted down the place of this quote in the URL in the first place, on second reading I was no longer able to find it… Let me know if you found it...). All of this leads me to reflect, not only on truth, consciousness and the others’ role in my life, but on the Internet and the role of such projects as Wikipedia for future humanity. Who might have guessed only some twenty years ago that such a thing as the Internet might a) be possible, (b) be available and (c) be widely appropiated. Who might have suspected the astounding volumn of a joint effort on-line encyclopedia, such as Wikipedia, which was compiled by volunteers in as little as five years, continuing to grow. Certainly there was no inkling that a research such as for instance the one presented in the last entries, might be possible within a few hours of attention. In this particular case going from snail-mailed book copies to blog entries, downloads and e-mails back to websites and their linking, to dialogues in person and digitally. Ever expanding the horizon of those participating in an ever expanding search. One may think such a process to be without focus. But is it? It makes the king in his kingdom the focus, that is you and me. Such a focus reflects an understanding of The Truth as being a person, who represents the meanings correctness and alignment as well, and the knowledge of choice to perceive this divine person as the infinite other or join Him. Do primary sources of Chinese thinking on these matters exist? If so, are they translated into English or German? Where do I find them? Yes, I also am all for Seth Godin. I admire the way he speaks to a world-wide Internet community. His approach comes as a vey welcome reaction to half a century of oppressive corporate dominance. It aims at excellent, small, steady modern markets. But is he really about economy...? Is not here a philosopher or call him a thinker appropiate to our day at work...? Sheeps' communication. For insiders only. There is something about the Lord's Prayer. Spoken in the morning, slowly and earnestly, it makes the day. Walking His narrow road I have experienced this result countless times. Sometimes I forget, and then remember: ...it does make the day!